Never fear, procrastinating preppers! Buying a preassembled emergency evacuation kit lets you be ready for anything—including wildfires. 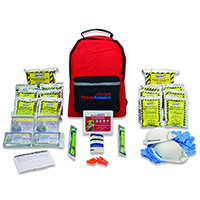 We’ve scoured through kit after kit to find the products that will give you the most bang for your buck and put you on the path to preparedness. Despite the name, the Complete Earthquake Bag is ideal for any evacuation emergency, whether it’s an earthquake or a fire. 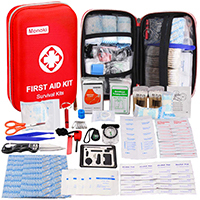 Along with a well-stocked first aid kit, this kit also includes food, water, and shelter, with food bars, water purification tablets, and a tube tent. It has safety goggles to protect your eyes from smoke, N95 dust masks (N95 means they keep out 95% of particles), a whistle, and 50 feet of nylon rope that can be used in a pinch as a leash for a pet or to tie up extra supplies. We like the helpful information pamphlet with a checklist of additional suggested items for you to add to the bag, like extra clothes and prescription medication. The bag itself has plenty of extra loops on the front for you to add your own gear. This evacuation kit is similar to the Complete Earthquake Bag. But it has only a regular hand-crank radio (no phone charger), and the 2,400-calorie food bars aren’t as robust as the 3,600 calories in the other bag. Luckily, the 4-person Survival Kit includes a few additional items that kept it in our top reviews, like a gas shutoff wrench, a can opener, and a deck of cards. We like that the kit’s duffel bag doesn’t have any writing on it, so you can fly under the radar in case of an evacuation without the risk of being a target for theft. 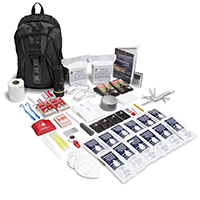 If you like “a place for everything and everything in its place,” then the Relief Pod Emergency Survival Kit will make your fastidious brain happy. This kit’s biggest selling feature is its unique design: it unzips and hangs from a built-in hook like a travel toiletry kit, with separate, clear, color-coded compartments for first aid, tools, food and water, and sanitation. It doesn’t contain any food or water, but that just means you can pack foods you actually like, instead of a cardboard-like food bar designed only for calorie intake. The Relief Pod kit’s main weak point is the underwhelming first aid kit, which contains only a few bandages and alcohol prep pads tucked into a pouch. But the bag does include a handy four-compartment pillbox for you to add your own medications, and the variety of tools and supplies in the rest of the kit make up for the lack of first aid. 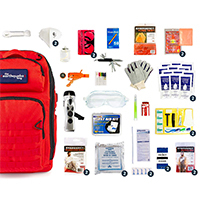 As one of the most popular evacuation kits on the market, we wanted to include the Ready America Backpack on our list, but it’s pretty basic as far as survival kits go. It will take care of your basic needs for a few days: food, water, and shelter—but it has no tools, no communication radio, and no flashlight. The packable food and water supply does give you a good point to start from as you begin to build your own evacuation kit. 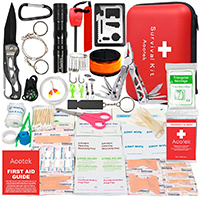 If you’re someone who doesn’t like to be without a backup plan no matter where you are, the Aootek Emergency Survival Kit might be right for you. At about the size of a softball, it’s small enough to fit into nearly any bag or purse—even into big pockets. It’s packed with useful tools, like a fire starter, knife, flashlight, fishing gear, first aid kit, and more. The reflective, light-up slap bracelet is great for being seen, whether you’re evacuating from a smoky fire or just out riding your bike at dusk. 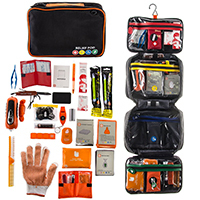 This kit doesn’t have food, water, or shelter, but it’s a great addition to any emergency kit that does. If you’re on a budget and you’re okay with throwing a few cans of food in with this kit, it’s another good starter pack for someone who wants to create their own grab-and-go bag. The hard-shell case is durable, and it’s about the size of a hardback book, so you can stick it into a backpack with clothes, food, water, and other supplies. We like that this one comes with a first-aid booklet and a well-stocked first aid kit, including more heavy-duty supplies like a tourniquet, triangular bandage, and a CPR mask. But be sure to check your kit—reviewers say that sometimes they come without adhesive bandages. If a wildfire is coming, you may find yourself heading to an evacuation shelter out of harm’s way. 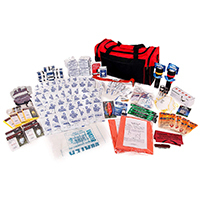 The Emergency Zone Essentials backpack doesn’t come with a tent, but with its included food and water, Mylar blanket, playing cards, and AM/FM radio, it’s a great choice if you have to head to an evacuation center. We like that it also has a straw filter, which can purify more water faster than the water purification tablets we’ve found in other kits. This kit also includes feminine hygiene products, plus other sanitary items like a razor, washcloth, and toilet paper. And at under $100, it’s an affordable option. What else should I pack in my fire safety emergency kit? Be sure to include a change of clothes (don’t forget socks and underwear! ), prescription medications, baby supplies if you have an infant at home, copies of your IDs and important documents (especially insurance documents), cash, and photographs of family members and pets. Because you’re preparing for a potential fire, it’s also a good idea to add a working fire extinguisher and some burn cream to your first aid kit. They might not do much in a serious situation, but they could help keep things under control until help arrives. Where should I store my fire safety kit? Cars are a perfect place to store emergency kits if you have room, because if you have to evacuate, you’ll probably be traveling by car. If you want to store your kit in your home, pick a spot that’s easy to get to (read: not down in the basement under a pile of boxes) so you can grab it and go. Can you carry a fire extinguisher in the car? Yes, but remember it’s good for only small fires, and you should never try to use it to put out an engine fire. Engines can combust quickly, so if your car catches on fire, the smartest thing to do is to forgo the hero maneuvers and get yourself and your passengers out of harm’s way as quickly as possible. If you do choose to keep an extinguisher in your car, make sure it’s rated for Class B (flammable liquids) and Class C (electrical equipment) fires. Secure it so it doesn’t become a projectile in case of an accident, and keep it out of reach of small children, unless you want to pay for an unexpected (and expensive) interior car detailing. How can I prepare for a house fire evacuation? First and foremost, make sure your home has working smoke detectors. A sensitive smoke alarm can buy you and your children precious seconds to escape. Create an escape plan with your family and practice it often, especially with young children who might be especially frightened in a fire. If your home is more than one story tall, invest in an emergency fire escape ladder for each upstairs bedroom, and install nightlights in bedrooms and hallways. As much as possible, keep floors and walkways clear of clutter to aid family members and firefighters in escape and rescue. Clean your dryer vents regularly, and make sure flammable liquids are stored in ventilated areas away from heat sources like water heaters, clothes dryers, and radiators. Get into the habit of using timers and alarms to remind you to take things off the stove, turn off the oven, turn off space heaters, and blow out candles. Have an electrician inspect your wiring regularly for any visual indications of wear and tear that could lead to an electrical fire. Keep working fire extinguishers in places where fires may start, like the kitchen, laundry room, and garage. Like most scary things, fires are more frightening when you’re not prepared for them. But having an emergency fire evacuation kit can let you confidently answer “Yes!” if anyone asks whether you’re prepared. To learn more about fire prevention and keeping your family safe from other common household dangers like carbon monoxide, check out our home safety articles, like Safety Hazards to Watch Out for Around the House. We evaluated the best fire safety emergency kits by researching the bestselling and highest-rated products on the market. We compared each kit to find the ones with the most useful, high-quality gear to ensure your survival. To find out more about how we rate and review products, check out our methodology.